With the regular season winding to a close, there still remains palpable intrigue. Western Conference playoff races have yet to be decided, but they are merely the undercard. The league lucked into having Kobe’s finale and Golden State’s potential 73rd win on the season’s final night, each game with significance that could last well beyond this season. There are also awards to be given out, though many of this year’s individual accolades seem to be forgone conclusions. For that reason, I am beginning on the team side: All-NBA, All-Defense, and All-Rookie. – For all the concern surrounding the Pelicans’ decision to shut down Anthony Davis, it should not cost him $25 million. Per Basketball-Reference, he has played 56% of his minutes at center, making him the obvious choice at the position for first team. The main gripe with Davis this year seemed borne out of expectation. After his superb campaign last season, he was expected to build upon that and push the Pelicans into the second-tier of Western Conference contenders. He has not taken that leap forward this year, and in many ways regressed, most noticeably on defense. Davis excelled last year playing the 4 alongside the Omer Asik, and logged 94% of his minutes at power forward (compared to 44% this season). Asik’s precipitous decline in 2015-2016 threw a wrench in the Pelicans’ rotations. He missed the first two weeks of the season nursing a calf injury, and proved to be completely unplayable upon his return. While he did not provide positive value last season, his defense helped mask his offensive deficiencies. This season, no such luck. Davis was forced into a no-win situation this year: He could either play power forward with the deplorably slow Asik, or assume the role of center and let Ryan Anderson take over duties at the 4. Either way, he was surrounded by little defensive talent. A glance through the guards on New Orleans’ roster also helps explain their 26th-place finish in defensive rating. Considering how much of a mess the Pelicans were this season, it’s easy to assign blame to Davis. But I cannot imagine a more adverse situation for the growth of a young superstar (turned 23 on March 11th). He had to deal with an idiotic new coach, a mediocre supporting cast (especially in the frontcourt), and injury luck that turned the Pelicans roster into a veritable D-League team. So I'm willing to give Davis the benefit of the doubt, and hope he gets back to elite defensive status next season. He was still a plus player on that end this year, and remains an excellent offensive threat. If the voters realize they can pencil him in at center, there should not be much controversy for his first team spot. – Toughest Omissions: LaMarcus Aldridge, Kemba Walker, Klay Thompson, Al Horford, Jimmy Butler, DeMar DeRozan, Carmelo Anthony, Karl-Anthony Towns. – It seems fair to focus on Aldridge, the no. 2 contributor on a 65+ win team. He struggled during the first two months of the season, with massive fluctuations in usage on a night-to-night basis. San Antonio wanted him to adapt to a new role, a tough challenge even for an 11-year veteran. His box score stats from the first two months of the year mirrored his on-court contributions: inconsistent and underwhelming. Aldridge is clearly an All-NBA caliber player, as demonstrated over the last 50 or so games. He has also adapted to the San Antonio offense, and shown that he is still fully capable of being the primary offensive option. Using New Year’s Day as an arbitrary constraint reveals the contrast between Aldridge’s two ‘seasons.’ Both his counting stats and efficiency numbers have dramatically increased. His scoring jumped from 15.5 PPG to 20.1 PPG, and his TS% went from 52.0% to 59.7%. When Aldridge signed, the hope was that San Antonio would be able to integrate him into the offense in a less ball-dominant role, while still maintaining his efficiency. His duties have vastly changed from those in Portland, yet he is in the midst of his most efficient offensive season to date. Aldridge has transitioned to a slightly more post-centric player with the Spurs, who let him feast against undersized defenders. His post touches per game have risen from 2.4 per game (102nd-highest in the NBA) in 2014-2015, to 5.7 per game (12th-highest) this year. He also modified his shot selection, reducing his mid-range volume, and eliminating nearly all his three-point attempts. The full breakdown of Aldridge’s shot attempts from each of the last two season is shown below, and depicts quite the shift offensively (data from NBA Savant). Once he got into form, LaMarcus was a dominant force offensively. The two main deterrents from choosing him for All-NBA honors were his defense and his lackluster start to the year. Compare Aldridge to one of the forwards he would displace, and he fails to measure up defensively. Paul Millsap and Paul George are elite defenders at their respective positions, and could each make an All-Defense team. Millsap has emerged this season as the essential piece to an elite Atlanta defense. A tenacious rebounder his entire career, this season he extended his defensive range this season to guard pick-and-rolls beyond the three-point line. George’s reputation as a perimeter stopper is well-earned, and his height and speed allows him to switch easily, and challenge shots even without an elite wingspan. Aldridge is simply not the same caliber of defender that Millsap and George are. And his slow start hurt his offensive output enough to keep him off an All-NBA team. Barely. – Kemba Walker was the other player who was closest to third-team honors. I wanted to reward his improvement, especially offensively. It is rare for a 25 year old point guard to suddenly become an strong three-point shooter, but Walker has eschewed convention. Charlotte was an absolute mess offensively last season, finishing 28th in offensive efficiency. They have climbed to 9th this season, due in large part to Walker’s newfound shooting stroke. Last season, finding a defensive scheme to stop Charlotte was hardly rocket science. Opponents simply went under screens and filled driving lanes. The Hornets’ spacing was hampered by Michael Kidd-Gilchrist, Lance Stephenson, and their other non shooters. This season, not only has Walker turned himself into a shooting threat, but is now flanked by an ensemble of elite floor spacers. Opposing players have to run over picks to guard Walker, giving him easy paths into the lane. When a defender comes over to help, he can pass out to a member of the rotating cast of Hornets shooters -- Courtney Lee, Jeremy Lin, Jeremy Lamb, and Nic Batum are all beneficiaries of this symbiotic relationship. When it came time to compare Walker to his third-team competition, I didn’t feel comfortable removing anyone. Lillard has been transcendent at times this season, and helped the Blazers fly past even the most optimistic of preseason projections (FiveThirtyEight had them winning 36 games). As for Harden, his attitude and defensive problems have been well-documented. But he is still one of the league's premier offensive forces, arguably trailing only Curry and Durant in terms of the value he can singularly add to an offense. – If Chris Bosh had been healthy for the entire season, and maintained his level of play, he would have made All-NBA 2nd or 3rd team, depending on his designated position. When his season prematurely ended, he had played 53% of his minutes at power forward, and 47% at center. He would most likely have displaced Cousins for 2nd team center. The magnitude of Bosh's contributions should not be forgotten. His chemistry with Dragic, his floor spacing, and his underrated passing all kept the offense humming along for much of the season. Unfortunately, another scary bout with blood clots shelved him for a second straight season. Hopefully he is able to return next season, and in similar form. – A tier below the “toughest omissions,” the next group of candidates included John Wall, Gordon Hayward, Giannis Antetokounmpo, Hassan Whiteside, and Nic Batum. – Filling out the first two forward spots is a total piece of cake. Draymond and Kawhi were the NBA’s two best defenders by miles, and it would range somewhere between “absurdly dumb” and “criminally insane” for a voter to give their first-place vote in Defensive Player of the Year voting to anyone else. They are locks for this team. – Rubio is probably surprising to see on the team, as he does not have quite the reputation of notorious “Curry-stoppers” Avery Bradley or Kentavious Caldwell-Pope. But he is a darling of real plus-minus, finishing with the highest DRPM figure of any point guard. Rubio’s on/off numbers are almost comical, with Minnesota’s defensive rating jumping to 108.8 when he’s off the court. His large frame gives him the advantage over most point guards, and his wingspan helps him disrupt passing lanes. And while counting stats are rarely a good indicator of strong defense, it's telling that Rubio has finished second in steals in three of the past four seasons. – In the debate between Bradley and Caldwell Pope, I favor Bradley due to his ability to play opposing guards aggressively without the security of a solid rim protector. It can be hard to separate Bradley’s success from Marcus Smart’s, who is an elite defender in his own right. When the two play together, they form a ball-hawking, pressure-heavy defensive pairing. But Bradley plays many of his minutes with the diminutive Isaiah Thomas, who he compensates for. – The inclusion of Duncan might also raise some eyebrows, but the center position was surprisingly devoid of elite candidates. On a per-minute basis, Duncan is an intriguing DPOY candidate. But he simply played too few minutes to add the requisite value for such an award. Gobert’s candidacy is similar. In his case, I chose him over Duncan due to the 433 (and counting) minutes-played gap between them. Both provided excellent rim protection and helped anchor the league’s two stingiest defenses (Utah’s defensive rating when Gobert is active would rank 2nd in the NBA). Gobert also gets the edge for first team due to Duncan’s inability to stay on the floor against Golden State. It’s hard to name a player to the All-Defense first team when he is rendered unplayable against the league’s deadliest offense. It gets worse when Duncan's performance is contrasted with Gobert's, who has excelled in disrupting the Warriors’ drives to the lane. – The case of Whiteside is probably the most interesting. He is obviously a prolific shot-blocker, but is hated by pretty much every on/off metric. I’ve always found that to be a bit overblown, but that does not make him a lock for one of the center spots. Even with Duncan and Gobert missing 20+ games each, Whiteside failed to distinguish himself. He has a bad habit of conceding post position, and struggles against powerful players if they possess any modicum of touch around the basket. Whiteside also tends to sag back on pick-and-rolls, which can result in disaster. This happened notably against Steph Curry, who erupted late against Miami's soft defense on screens. And when Whiteside does venture beyond his comfort zone, ball handlers don’t need to be Curry to take him off the dribble, and easily get to the basket. Whiteside’s block numbers are eye-popping, and his metrics are downright awful. I think his true value is somewhere in between, and he certainly has the potential to make many All-Defense teams. Just not this year. – Four of the first team spots are locks. Towns’ case does not even need to be made. He was the best rookie this year, and had the best rookie season of any big since either Blake Griffin’s in 2011, or Duncan’s in 1998. Considering that he played just one year of college, his feat only becomes more impressive. And while they will not challenge Towns for Rookie of the Year, Jokic, Porzingis, and Booker each had terrific seasons of their own. – The debate between Jokic and Porzingis is a great one, even if its participants are limited to NBA junkies. As for Booker, he became Phoenix’s main facilitator and scorer once Brandon Knight got hurt on January 19th. When Knight has been out, Booker has averaged nearly 18 points per game. Pegged as a one-dimensional shooter coming out of Kentucky, his ability to run an offense and score off the dribble seem way ahead of schedule. And he’s only 19. 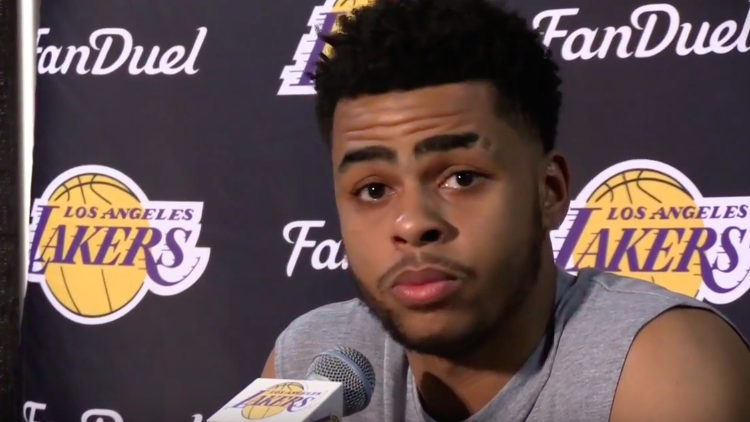 – I still don’t know what to make of D’Angelo Russell’s season in Los Angeles. All year long, I felt he was being held back by Kobe’s shot-happy approach and Byron Scott’s strange decision making. And for a fleeting moment, I was validated when Russell had an exemplary 8 game stretch spanning late February and the beginning of March. He tossed up a 23.3 - 3.1 - 4.8 stat line, on 47.1% shooting. Russell was up and down throughout the rest of March, mostly due to Kobe’s propensity to take 20 shots anytime he feels healthy enough for it. He had a few solid games, and built on his strong start to the month. Then quite suddenly, Russell found himself caught up in one of the stranger scandals in recent memory. He alienated his teammates, and pretty much every other NBA player. It’s pretty hard to be optimistic going forward, but he displayed his offensive talent often enough this season to earn him a spot on the first team. – On the second team, Winslow was the strongest candidate of the bunch to displace Russell. The two are polar opposites as players. All of Winslow’s value comes on the defensive end, and he has meshed well with his veteran club. If his jump shot develops, Miami will have struck gold on the wing. – Okafor and Turner are frustrating at times. Turner recently lost his the starting job to Lavoy Allen, and is prone to disappearing on offense. But his brilliant games make him a tantalizing prospect, with his elite length and deft shooting touch. As for Okafor, he seems like nearly a finished product. Strange to say about a one-and-done big man, but it seems unlikely that he will add another dimension to his game. Before the draft, Okafor was asked about adding a jump shot to his repertoire. He kind of bristled at the question, and said something to the effect of “Why would I do that? What I’ve been doing works, and it’s what I’ve been working on my whole life.” Both his attitude and his play suggest he is content to fit a single archetype as a player -- a solid post threat, and nothing more than that. – Mudiay and Lyles round out the second team in an especially strong rookie class. Mudiay’s efficiency has drastically increased since his rocky start to the year. The last 25 games or so, he has actually been a plus for Denver’s offense. It doesn’t completely mask Mudiay’s first few months, but it is a great sign heading into the future. In Utah, Lyles had a fairly quiet year, but provided some value nonetheless. Quin Snyder elected to play Trevor Booker over the rookie, which stunted Lyles’ minutes. During his sparse playing time, he showed his ability to be a playmaking forward, and stretch the floor. It almost seems inevitable that Utah will develop him into another solid, if under-appreciated player. And that rounds out the team awards. Piece on the individual awards also coming out this week, not that there’s much suspense about my (or anyone’s) pick for MVP.